Are you the type who hasn’t fallen for the 1930’s wedding ring marketing ploy proclaiming: Diamonds are forever and everyone needs a solitaire? Or, are you looking for something outside of the box, no pun intended? 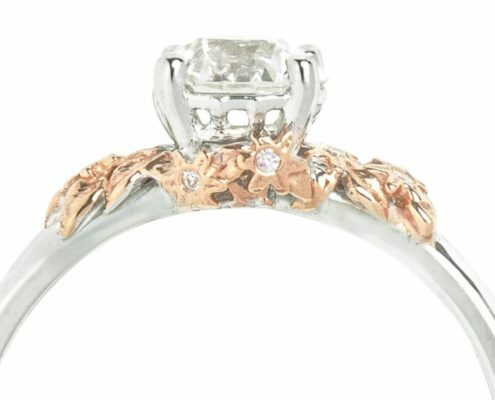 This curated post of unique engagement rings and wedding bands for women is for you! 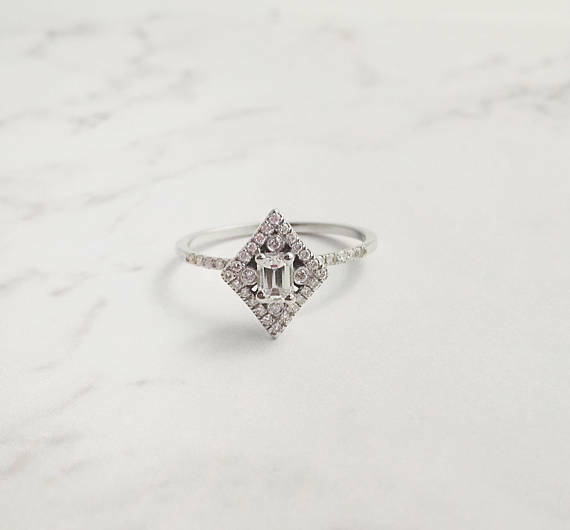 With so many unique rings online and offline just waiting to be found, we decided to spotlight 59 awesome ring beauties. They aren’t exactly traditional, but each one tells a story, and a few are even one-of-a-kind. 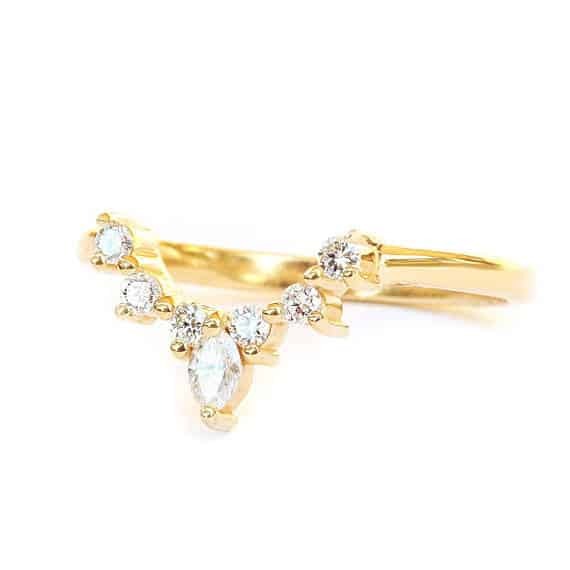 With an Australian Opal center and side diamond accents, this ring offers a classic yet vintage feel. And, it is definitely unique as no two are alike! Poetically sweet, the master mold for this ring was made of an actual tied piece of string. 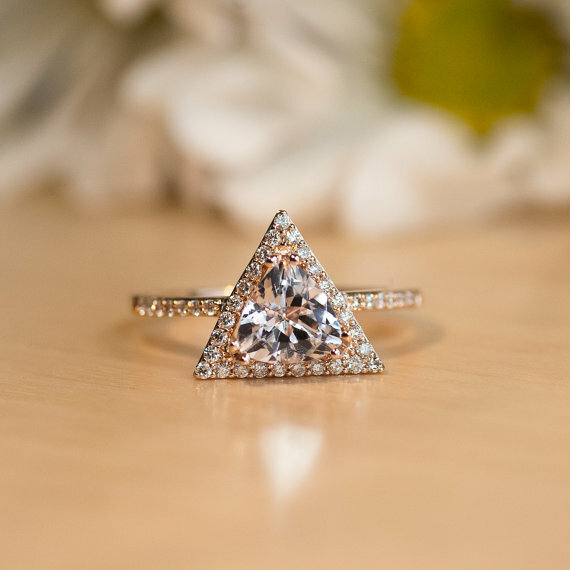 Move over round diamonds, this triangle cut stone is going to stand out in a crowd. If size matters to your special lady (and you know it does), consider a Trillion cut. Compared to a standard round cut gem of the same carat, a trillion cut stone will usually look larger. 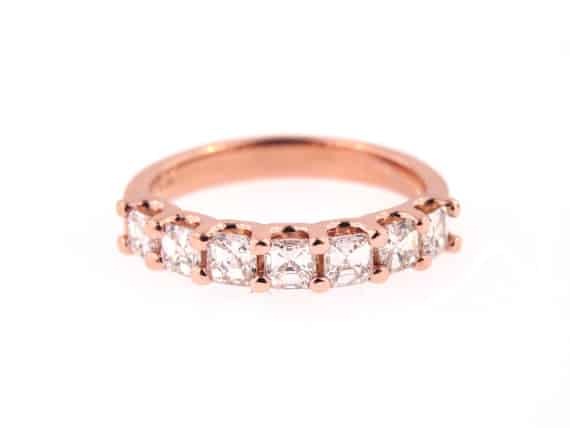 Besides that, you won’t run across this cut shape often, making this ring choice the perfect option for those looking for top quality uniqueness! 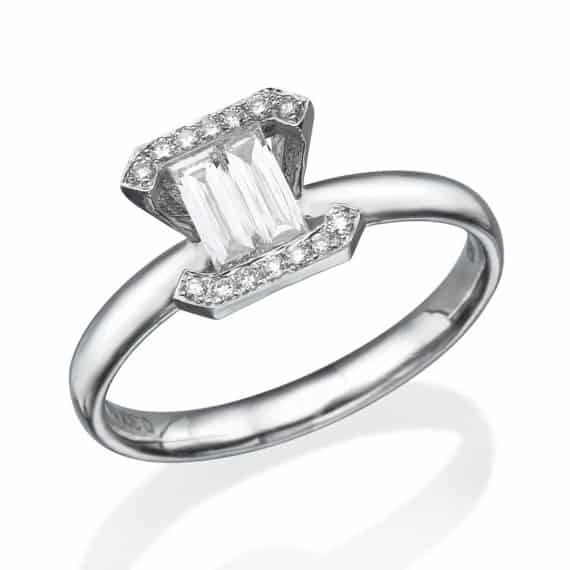 If you are not feeling the above trillion cut halo ring, how about this emerald cut centre stone surrounded by micro pave diamonds set in a rhombus shape? It offers all sorts of unique geometric prettiness! 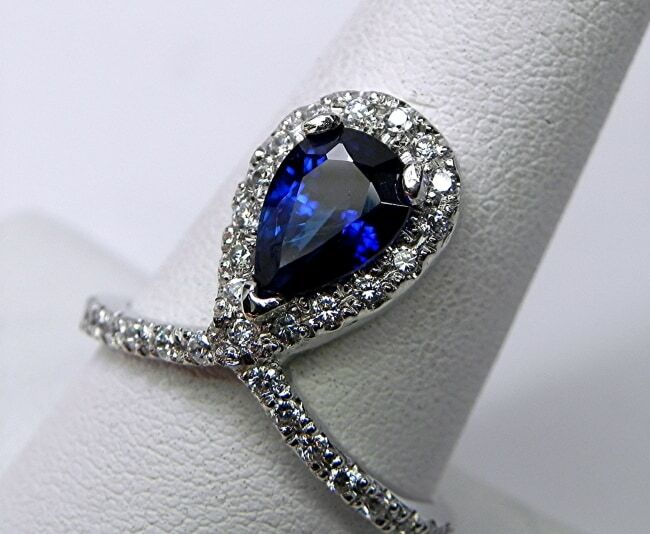 Add a bit of drama by having the option to wear this breath taking blue sapphire that is set amongst pave white diamonds, either upside down or right side up — a daring take on the traditional halo ring. If your lady likes to live a life that is bold, daring, and unforgettable, this is the ring for her. 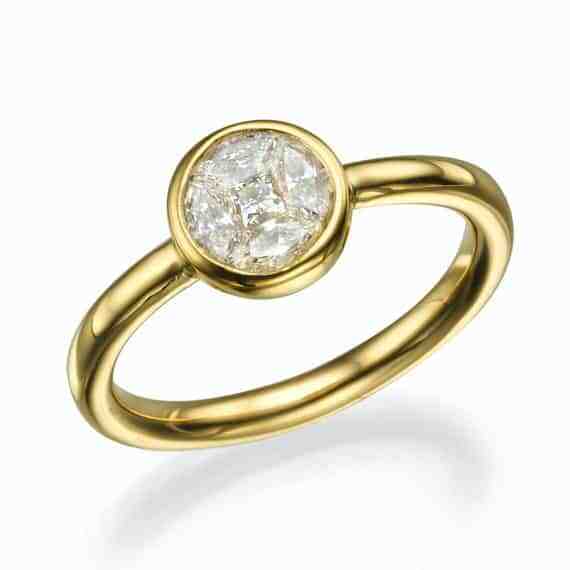 An elegant and sleek eco-friendly engagement ring that could be the perfect alternative to an expensive diamond ring. 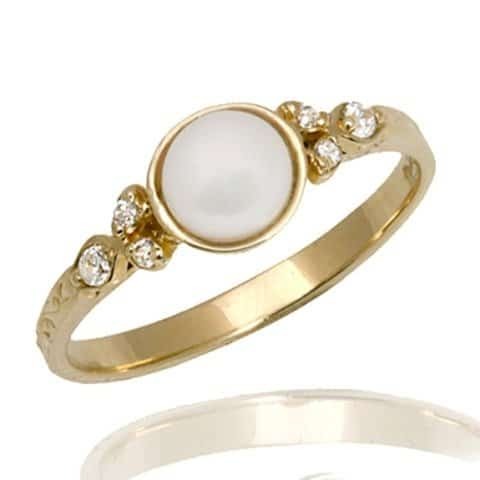 The creator of this 14k yellow gold cast ring polishes it up using the same techniques that stone cutters use in order to achieve a super-sparkly look. Okay fine, this is a lovely round solitaire diamond. Yet take a peak at the magical detailing underneath it. 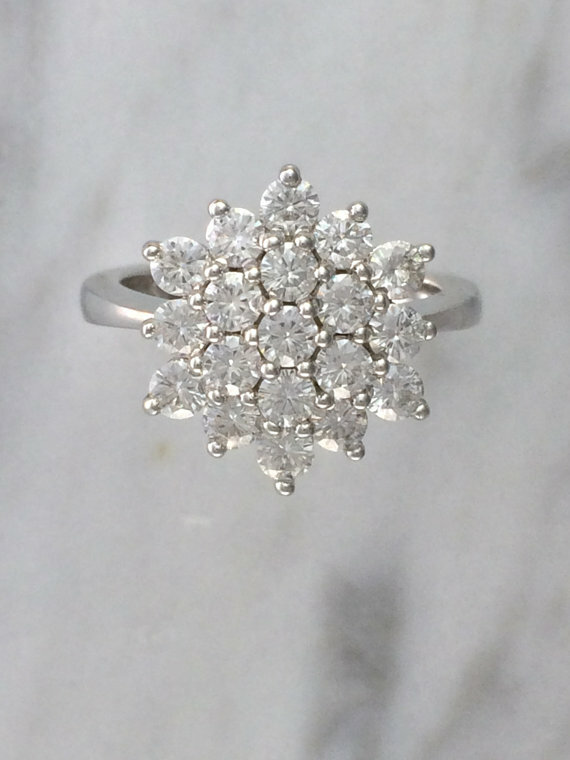 Like something found in the ocean, this beauty looks like it has little mini starfish with individual diamonds trying to climb up the diamond to garner attention. 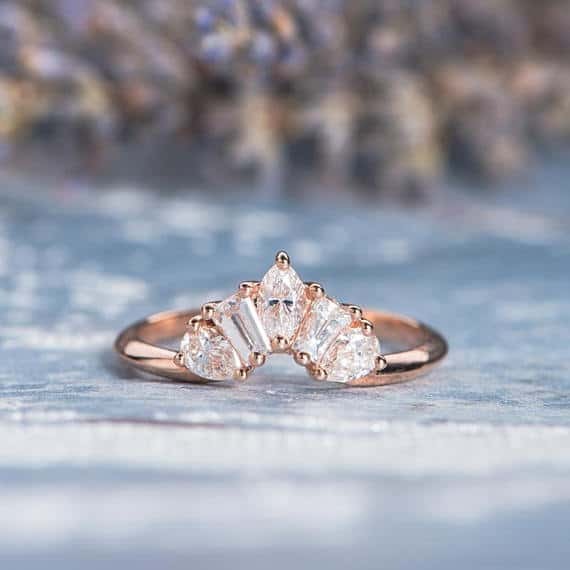 Using both platinum and 18k rose gold, if there are any Little Mermaid fans our there this rings sings that you want to be part of her world! This is a simple stunner with a twist. 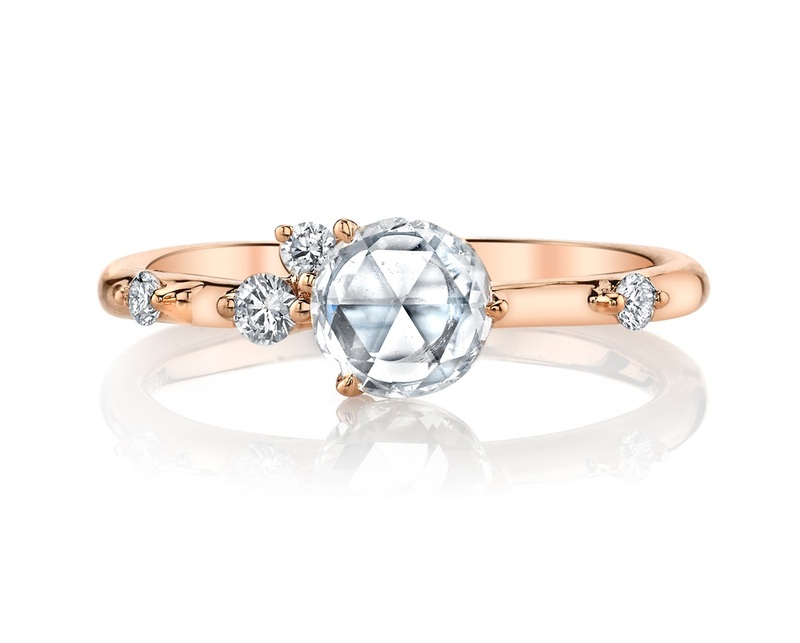 A ring that visually tells a story of two coming together to cherish their diamond love for one another. Sometimes less is more. 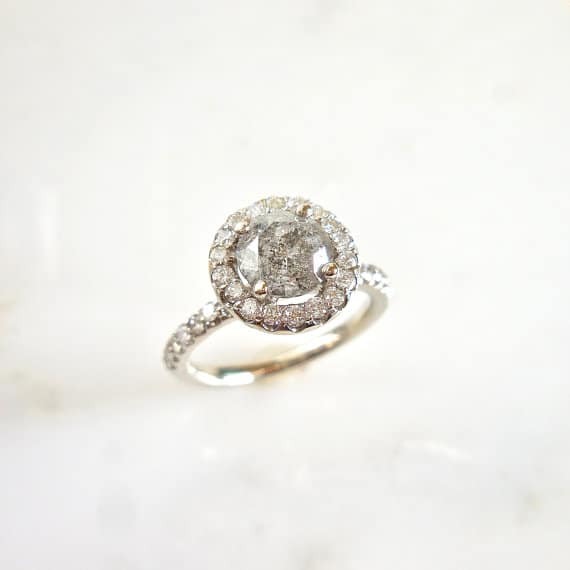 If less is not enough for your lady, then this one of a kind pre-owned swirl halo side accented engagement ring will most certainly have passer by’s taking double takes. If you are looking for unique and luxury than you can’t go wrong with asking her to marry you with this ravishing 0.5 carat beauty. Reminiscent of a kaleidoscope, this lovely asymmetrical engagement ring features a rose-cut centre stone. A rose-cut diamond offers a somewhat glassy appearance and dramatically less sparkle than that of a round or princess cut diamond, which are usual the go-to choice. However, this cut and ring does offer an intriguing alternative to those looking for pure uniqueness — like Jennifer Aniston who received a rose cut ring from Justin Theroux back in 2012. This pear shaped beauty can either be set vertically *yawn* or sideways like the picture below. An unsuspecting placement, which we are completely ga-ga over! Another ring from the talented artist capucinne, this rainbow Moonstone in 14k white gold (also in rose or yellow gold setting) gives off a completely whimsical flair perfect for those looking for that non-traditional ring. 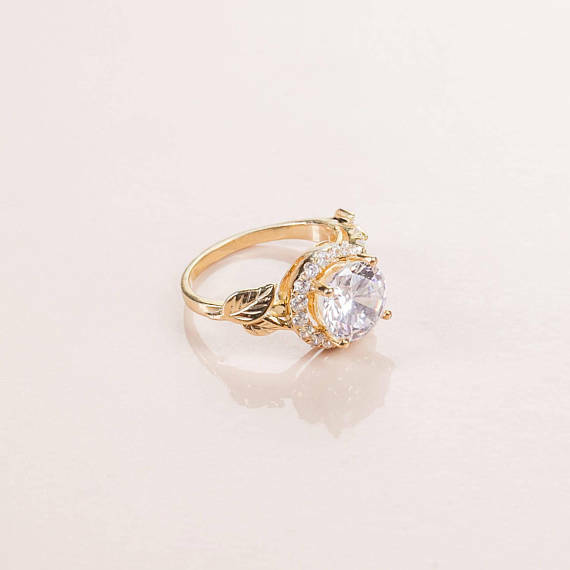 For women who are into crystals or a rustic look, this ring is sure to be a favorite. 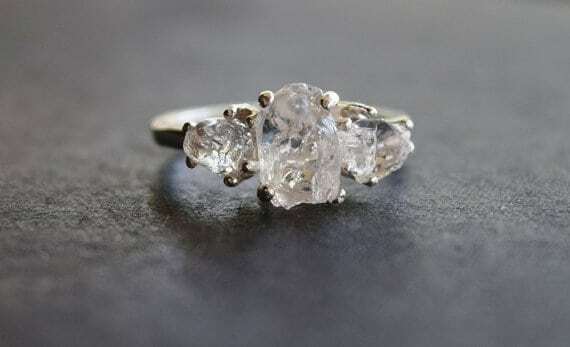 The clear highly prized volcanic Quartz Crystals set comes in either a sterling silver or white or yellow gold ring. 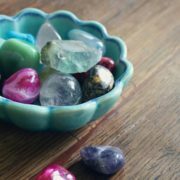 Let this crystal shine like a diamond with natural faces. As if resurrected from a time long ago, this diamond set into a beautiful 18k gold bezel provides an ancient look and feel. 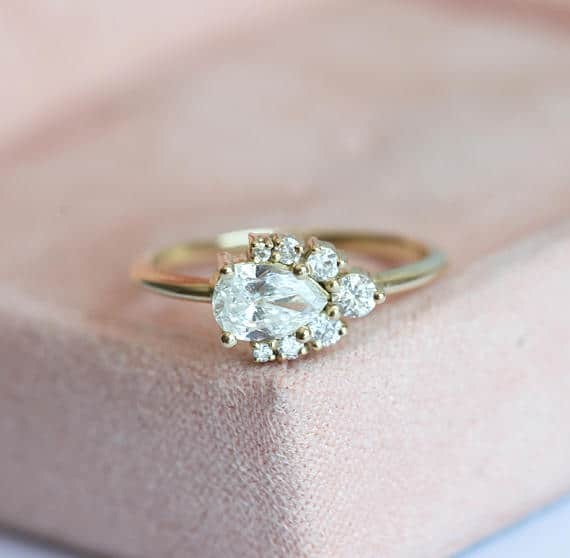 A fitting engagement ring for someone who loves vintage style jewelry? If you are looking for a unique ring that offers a little more of a demure feel to it, than this captivating emerald placed in a flat profile set might be just the ring you have been looking for. 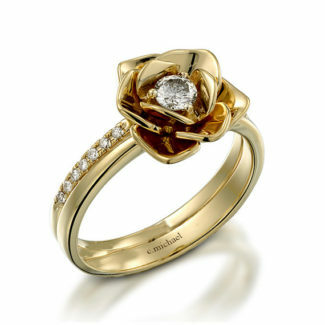 Present her with a love knot engagement ring in 14k gold, a symbol of your eternal love. 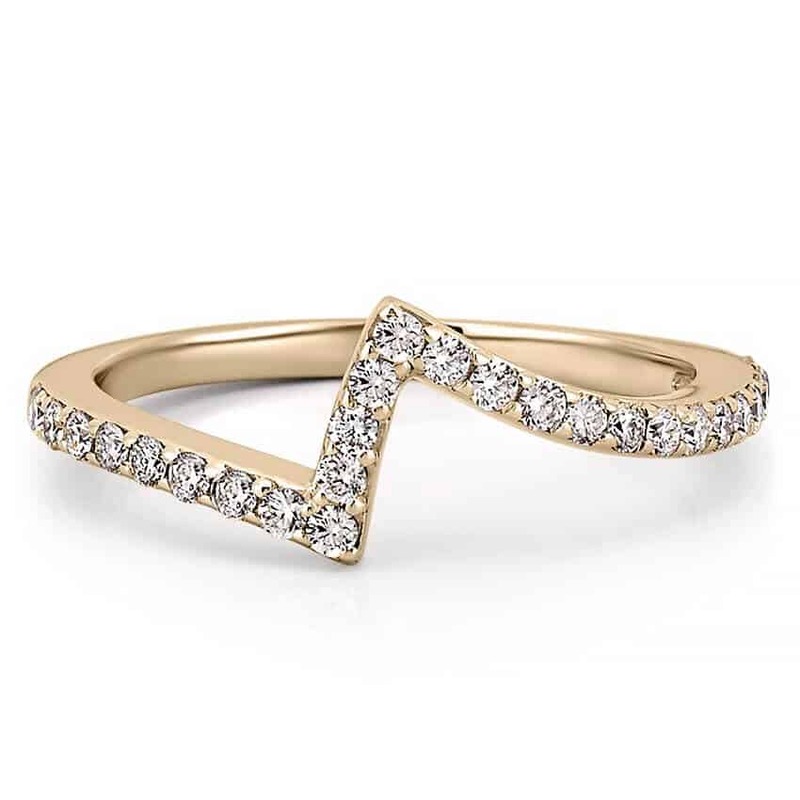 Building on the previous knot ring above, if you love the look and want a little more bling, this infinity knot with diamonds offers the best of both worlds! 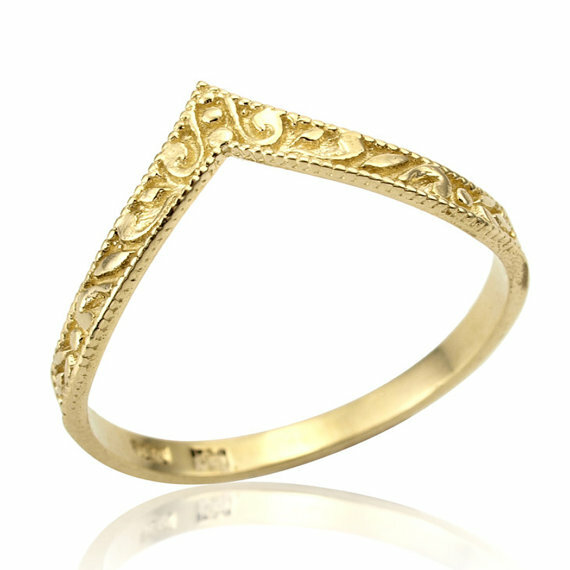 A Greek goddess-inspired handmade ring with leaf design that is absolutely stunning. 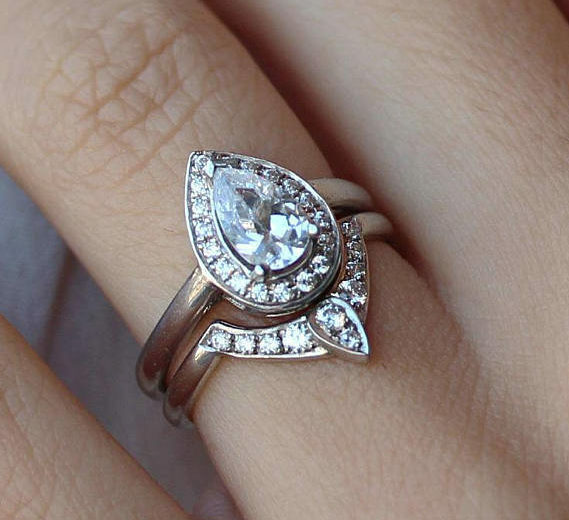 Natural conflict-free diamonds in a unique asymmetric design completes the look by offering a little extra bling. 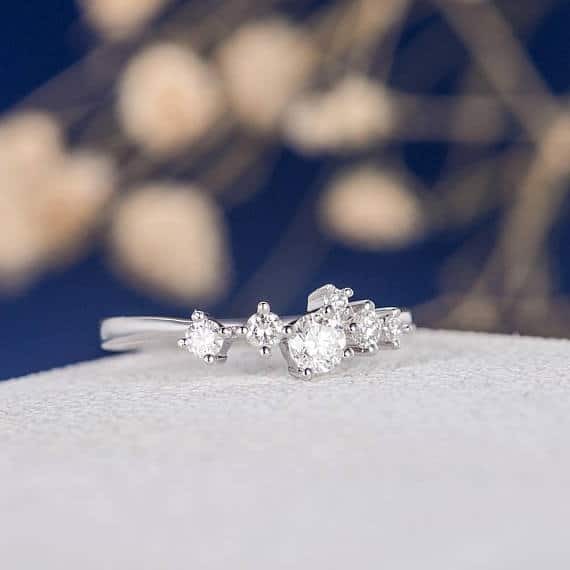 Perfect for a New Year’s Eve proposal, this beautiful cluster ring in 14k white gold encapsulates the vision of a beautiful snowflake falling from the sky. 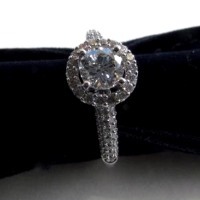 The vintage inspired ring setting is adorned with beautiful maisonette diamonds. 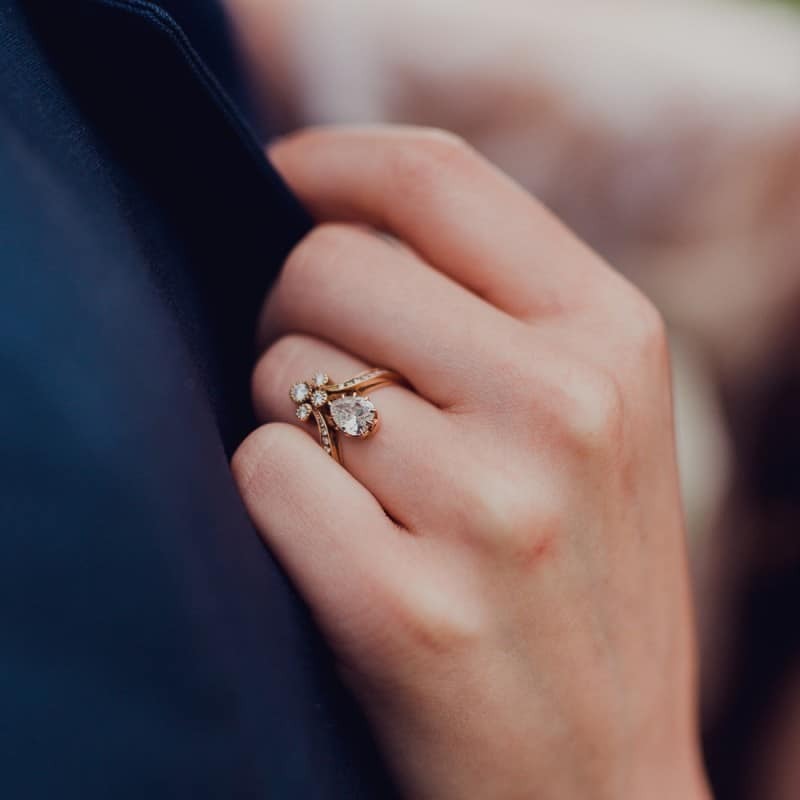 If romantic love stories steal her heart, choose a ring that is reminiscent of Victorian times — when jewelry was created with romance and nature in mind. 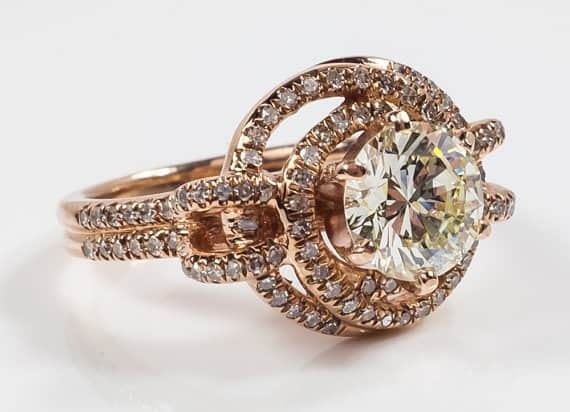 This unique diamond ring is made from 18k rose gold and features a delightful pear shaped diamond. in an eternity motif. Based on an original vintage design. 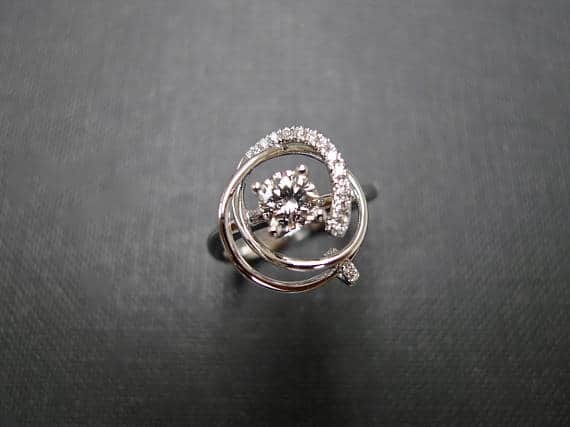 An earthy, organic ring featuring a beautiful round diamond set amongst accented diamond petals. A true work of art in and of itself. 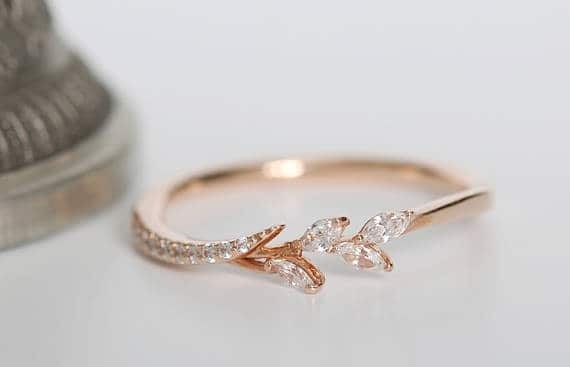 If the above ring is a little too blingy, but you are feeling the beauty of the rose, how about this handmade 14k yellow gold engagement ring shaped in a flower with a round centre stone? 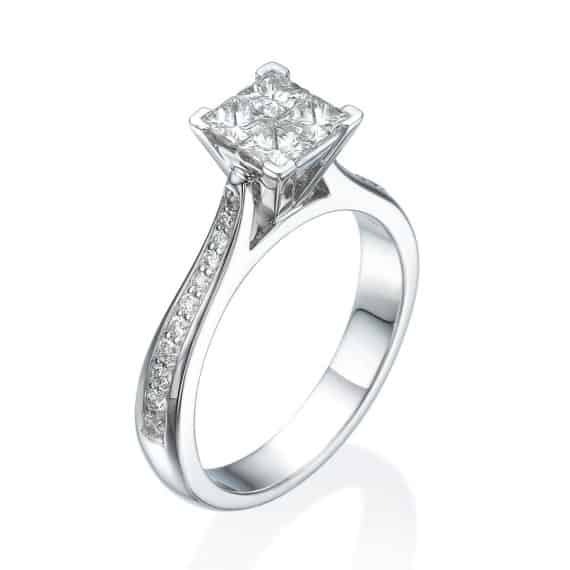 A truly one of a kind trillion cut diamond ring is sure to draw the attention of anyone looking your way. Want a design that is still a bit traditional, but offers a unique choice? 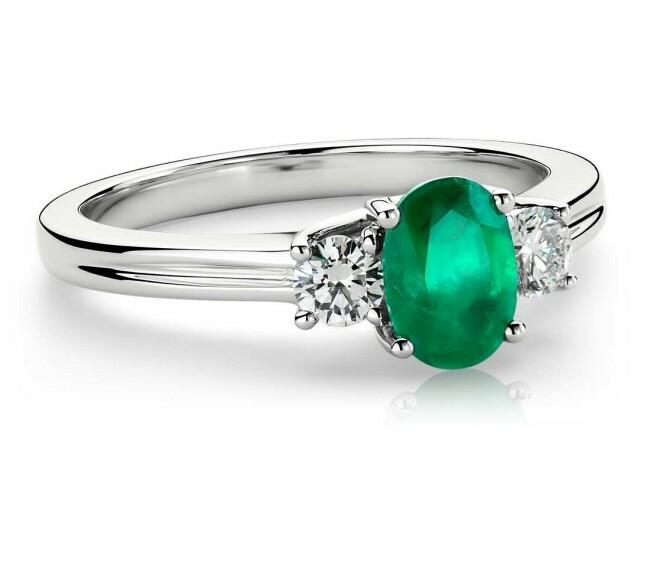 Select the rich color and vibrant gemstone of this oval emerald and gold setting. Those with an Irish heritage will understand why we simply could not keep this ring off our list! 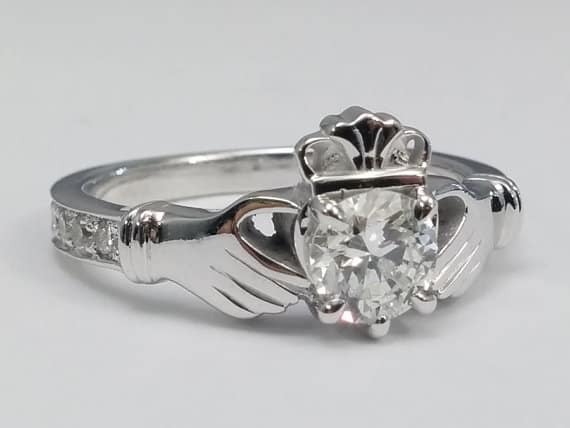 Celebrate your marriage with a token of Irish love – a beautiful diamond Claddagh ring. 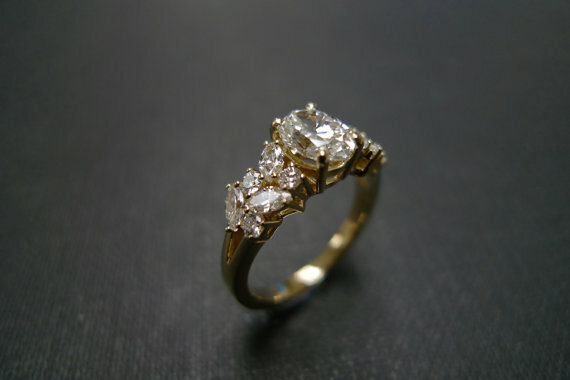 See more rings similar to this in our 10 Celtic Engagement Rings Inspired by Irish Tradition post. Maybe it is the red nail polish, but the photo below shows a ring that is oh-so feminine and elegant. The fine detailing of 2 heart-shaped side diamonds makes for the sweetest touch. 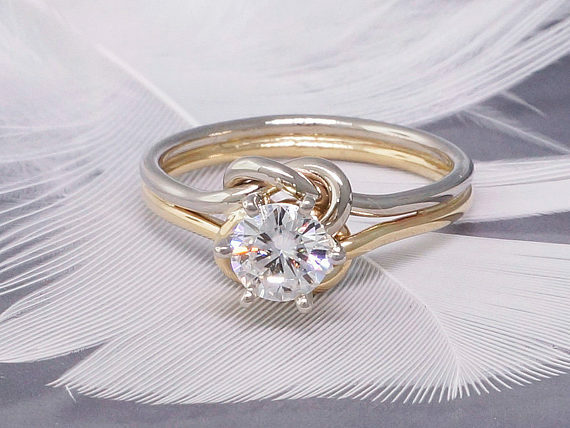 A classic engagement ring with a complete twist … literally. Three hoops each made from either 18K rose, yellow, or white gold wrapped together to form a unique eye catching ring. This ring is not only unique, it is beyond elegant and going to shine, shine, shine from all angles of the beautifully cut oval and marquise shaped diamonds. 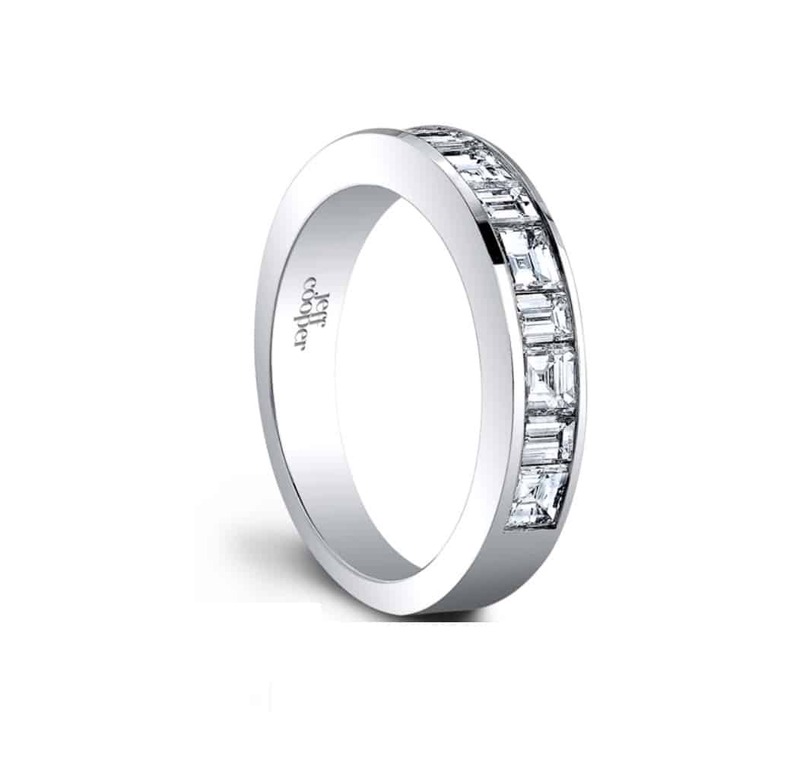 Totally worthy of being a tiara, this ring can also be engraved at no extra cost. Added bonus! If you are looking for something truly unique, this is the ring for you. A salt and pepper diamond. We have never seen anything like it and we bet you haven’t either. A diamond in the rough and one of a kind. A salt and pepper diamond basically has a lot of inclusions, normally what a diamond ring shopper is trying to avoid. But this is where the beauty lies. These diamonds show the real flaws and the natural beauty of a diamond. 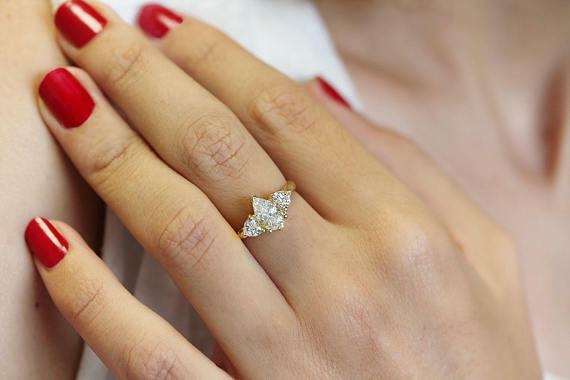 Another beautiful and uniquely shaped diamond is the marquise. The marquise shape is believe to have been commissioned by King Louis XIV of France which reminded him of his true love perfectly shaped mouth and smile. I suppose so. 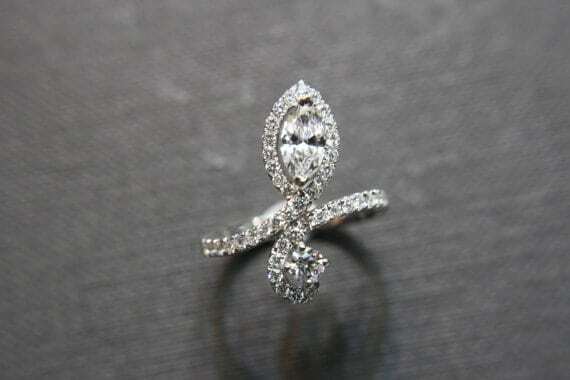 In any event, this diamond offers a very dramatic shape and makes a dazzling choice for an engagement ring. 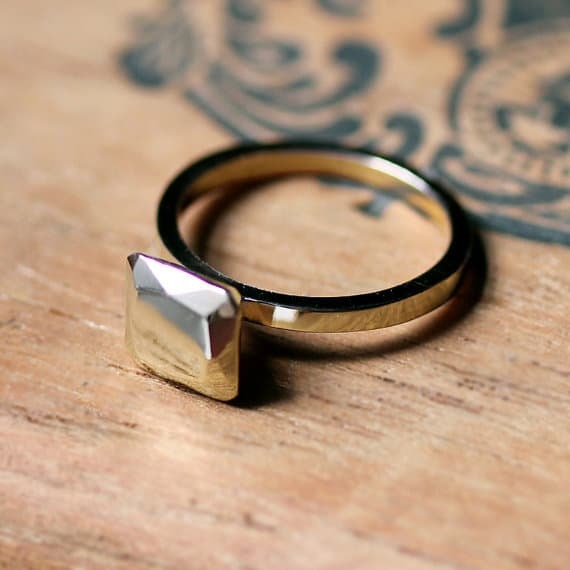 The illusion of this ring is fantastic. What looks like a near carat size rock, is really smaller diamonds put together in a channel set. If budget and quality are factors for you, think of other ways to get more bang for your buck. I once had a boss who sported a ring like this and it tricked me every time. 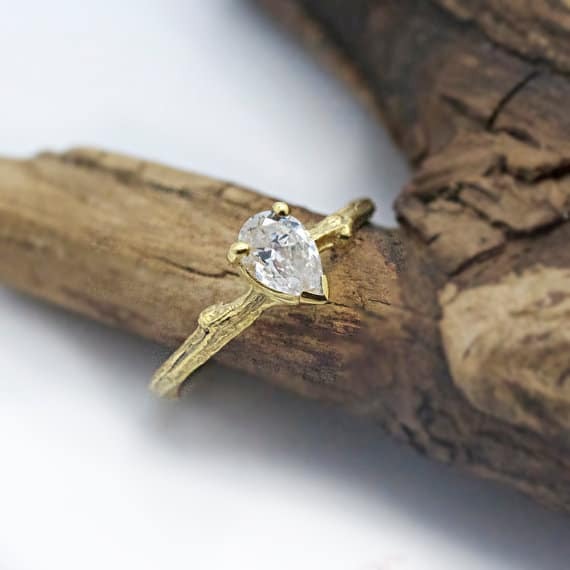 This earthy looking engagement ring made from an organic twig cast would be perfect for any gal who appreciates the beauty of the great outdoors. 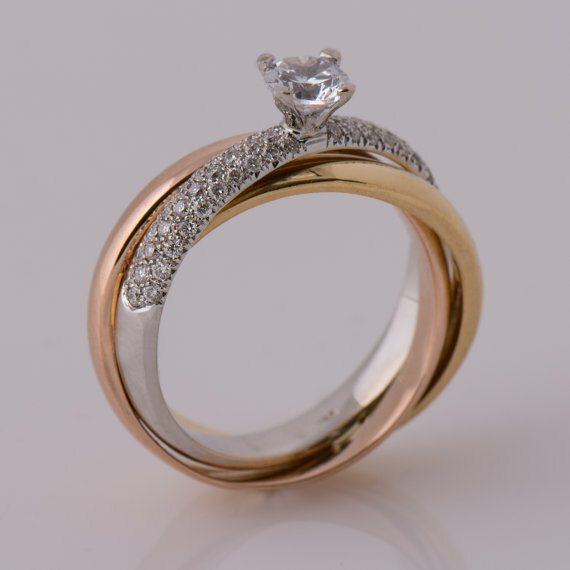 Like the above illusion, this roing takes two smaller diamonds and makes them look bigger. 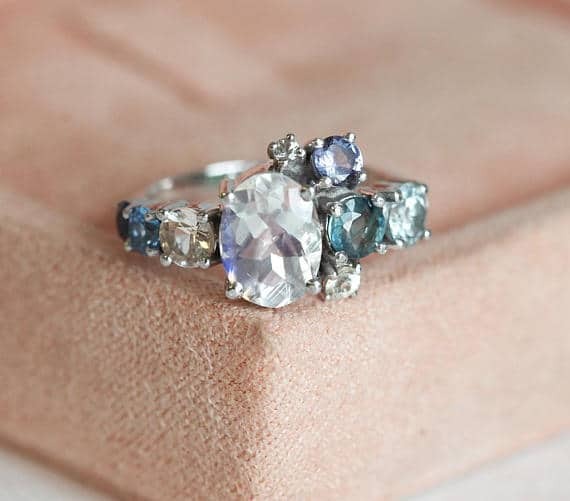 This new handmade ring is made to look like a unique one of a kind vintage piece. 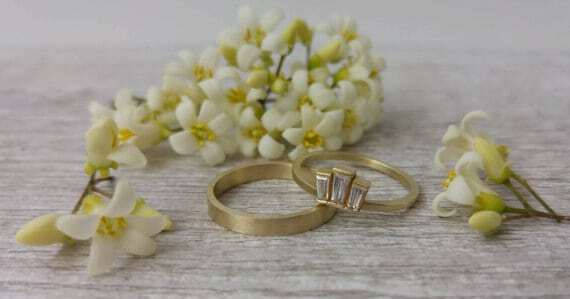 A three ring set (matching engagement ring and wedding band set) that is made for a lady who is looking for something different. 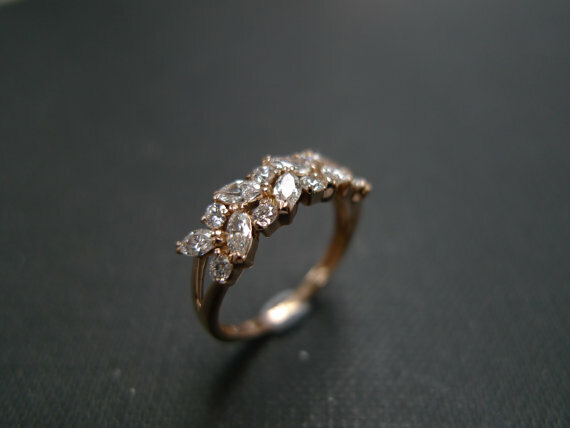 This beautifully tapered baguette diamond ring and matching gold band would be the delight for any roaring 1920’s lovers. Art deco all the way! We love any unique story of where a diamond comes from, like this one. It’s a mine cut diamond, which was handcut using only hand tools of the 1800’s-1900’s. 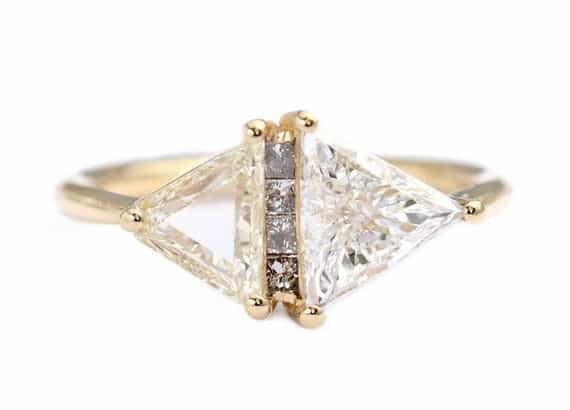 Being that it is hand mined, the facets of this diamond tend to be less uniform and larger, which gave these sorts of diamonds the phrase “cut for candle light,” as they were cut to catch the beautiful light from the flickering fire. The steep depth of this diamond gives it volume as well as a faint hint of yellow color, like that of a lovely glass of champagne. Cheers to that! 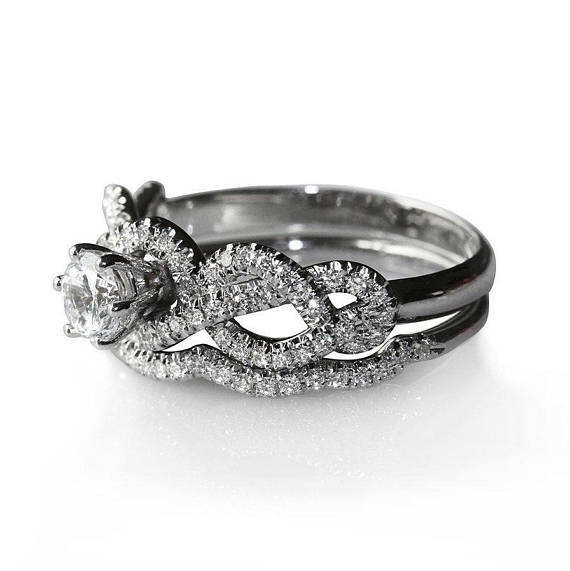 A dramatic and beautifully shaped slithering engagement ring. Just be sure she likes the look of snakes first! Perhaps perfect for the women who loves a good spinning class. Why you might ask? 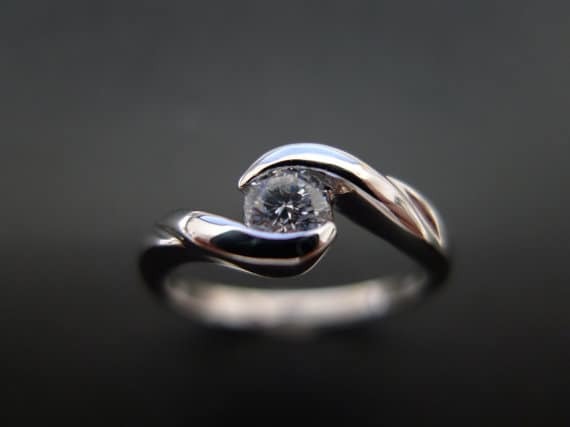 Well because this beautifully unique ring actually has a small circle that is set with diamonds that can actually spin. 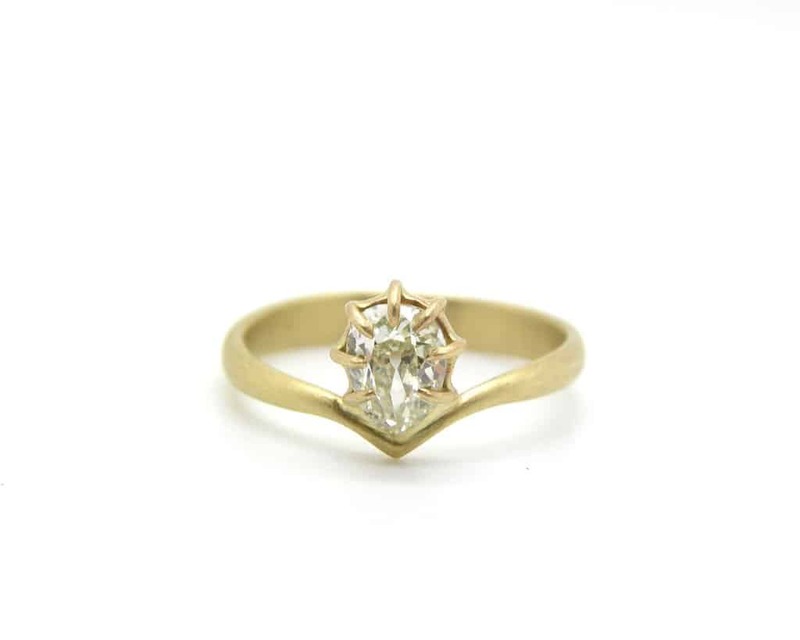 As for engagement rings, I don’t think you can get any more unique than that! 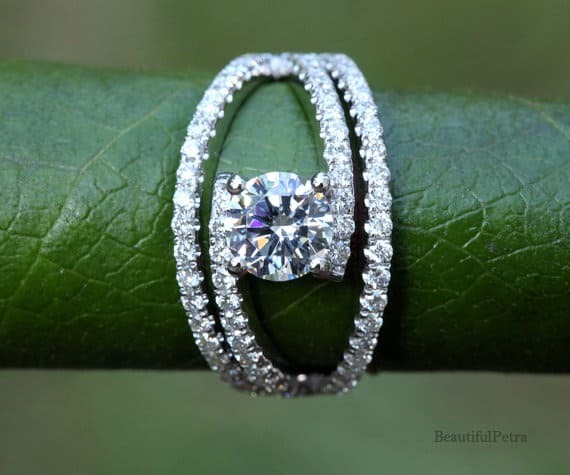 Pair this wedding band with your engagement ring to create a beautiful and unique set. A matching set that will always bring a smile to your face. 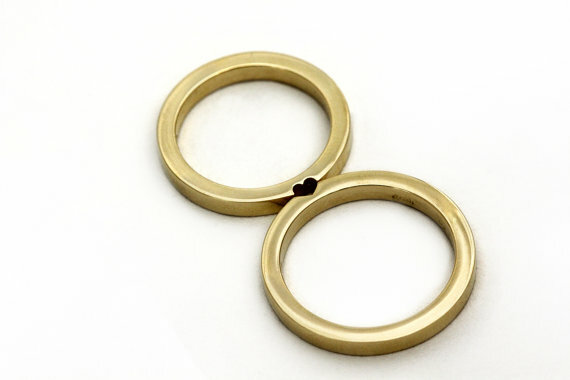 These matching wedding bands brings the ultimate symbol of love in two rings. 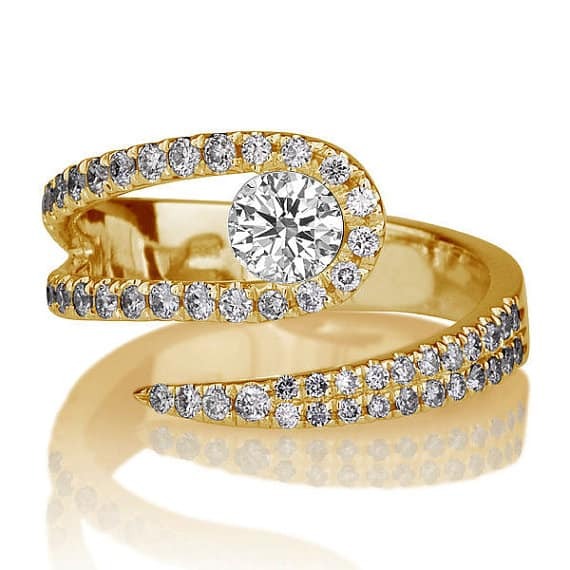 The perfect addition to complete a round center stone engagement ring set. 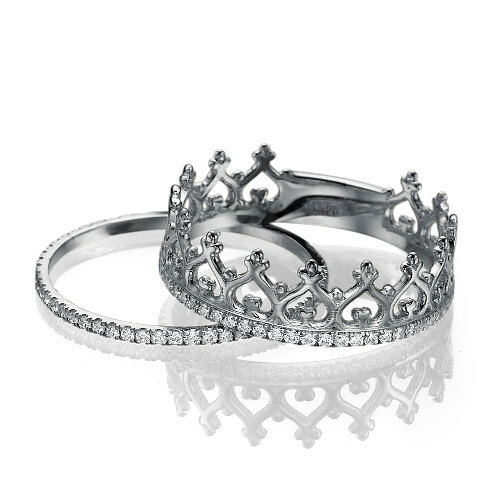 Fit for a queen, this unique diamond crown band comes from a highly rated Etsy jewelry maker. We love the design and think it would be perfect for a fairy tale castle wedding! Think Big. The Carly Engagement Set is a clean & classic channel set design. 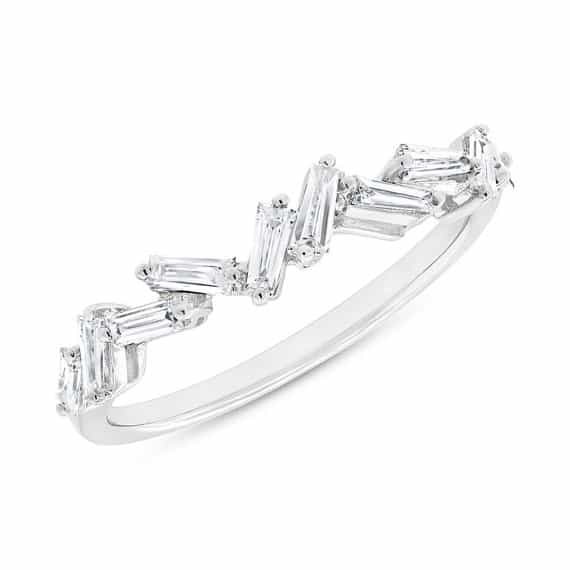 By alternating stunning step cut carre diamonds with straight, step cut baguette diamonds, it gives you that clean, yet flashy look to that can’t-be-missed center stone. 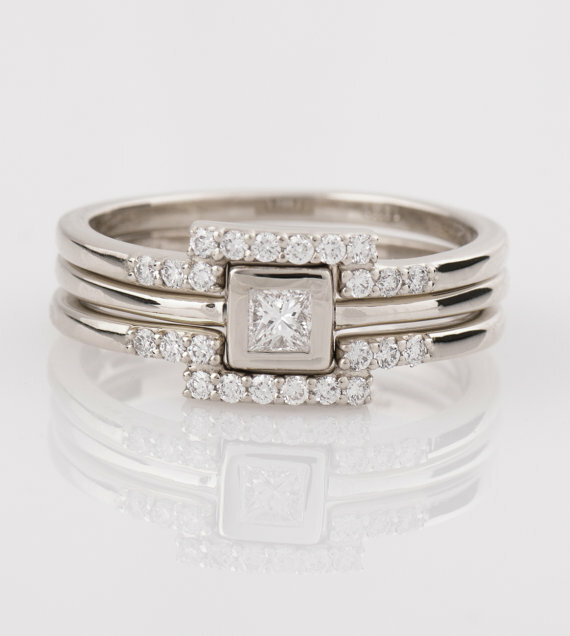 A seamless fit in a timeless style, our Carly Wedding Band was designed to match beautifully with our Carly Engagement Ring. 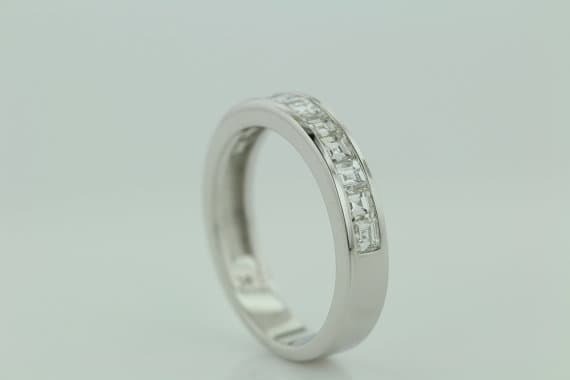 Hand crafted in either Platinum or 18k Gold. A lovely art deco wedding band features a charming decorative engraved pattern on top of the band, which will elegantly fit any size engagement ring. 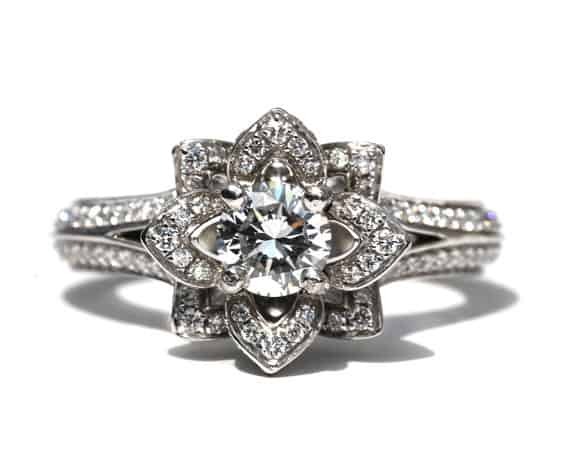 Hand crafted rings are so romantic and totally one-of-a-kind! Each unique ring is custom-made with the impression of your fingerprint. This wedding band is unique all while being minimalistic at the same time. We love the stacking wave design. 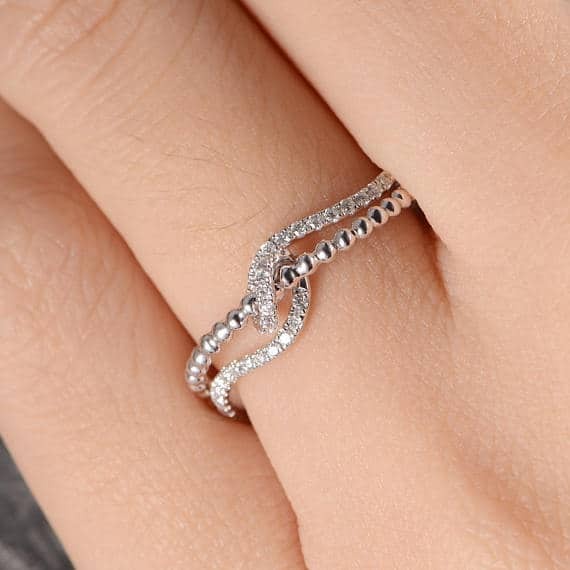 A love knot that is beautiful just on its own, this eye catching half eternity wave ring will be lovely sitting next to her engagement ring. 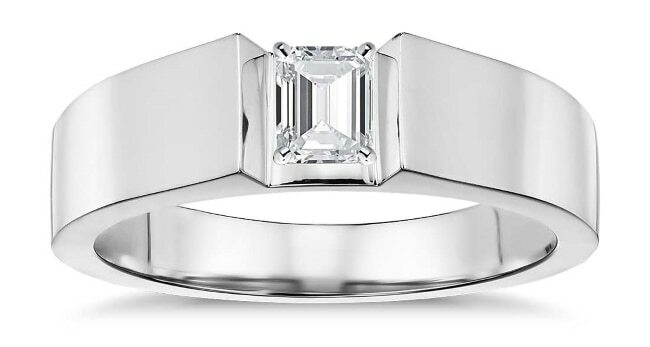 This exceptionally unique engagement ring will take her breath away while you say your I-Dos. 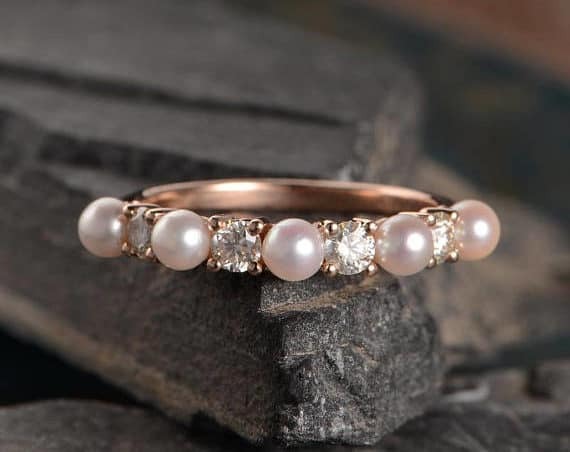 You don’t see pearls being used very often in engagement rings or wedding bands for that matter and that is exactly why we love this ring. 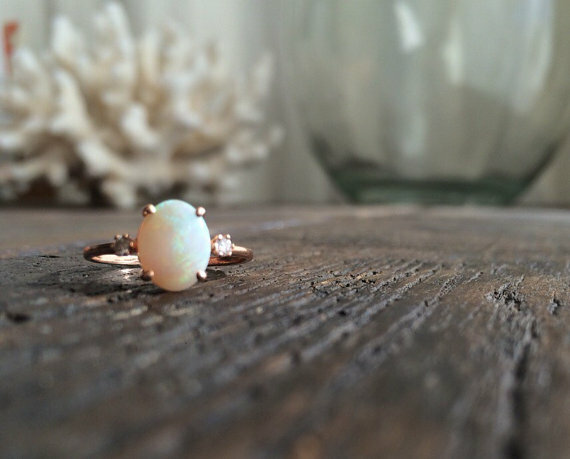 If pearls are good for any occasion, this will be a hit sitting beside her engagement ring. 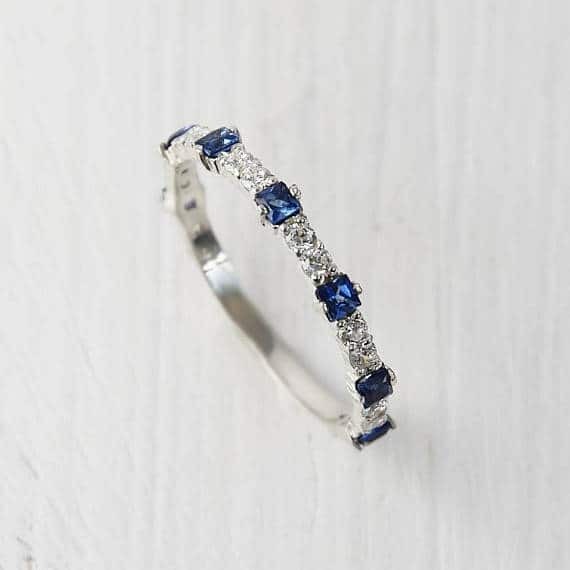 If she still needs something blue for her big day, this pretty sapphire ring will check that box off her list. 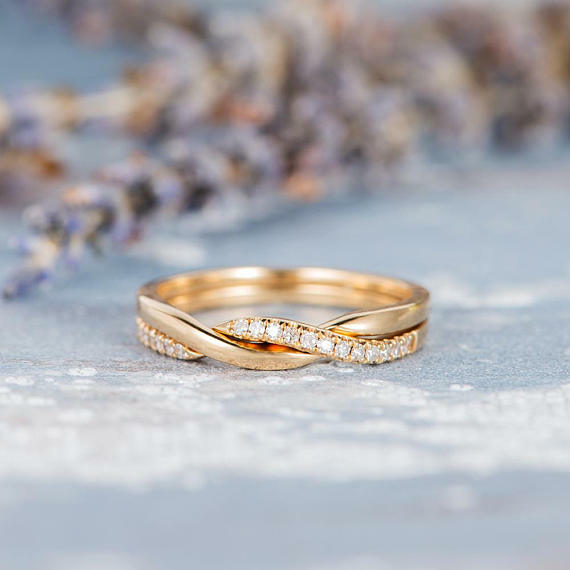 If she has a knock out engagement ring, choosing something a little more delicate and minimalistic, such as this unique stacking wedding band, should do the trick. 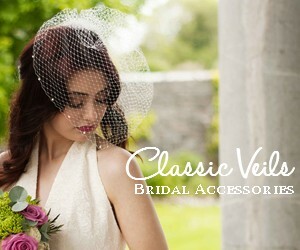 Looking as though snowflakes are falling, this beautiful band would be lovely to receive during a winter wedding. Complete your engagement ring with this leaf side wedding band to create the illusion of a flower in bloom. 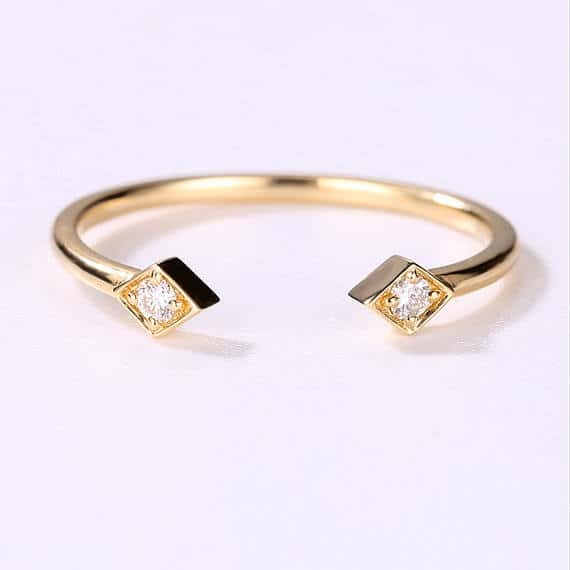 Pretty enough to be an engagement rings, this marquise tapered wedding band gives off a 1920’s flare and would frame an engagement ring beautifully. There is always a die-hard fan in the room. If Harry Potter means something to the both of you than perhaps this fun Patronus band inspired by the world of Harry Potter would make the perfect match. Phew! That’s all for now. Hope you were able to fall in love with at least one of the above unique rings! !